Hidden Village Family Retreat! New Listing! 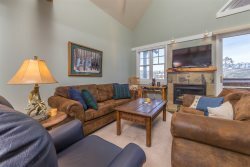 Our spacious and well apointed condo is nestled in the Hidden Village neighborhood, conveniently located minutes from Town Center and 6 miles to Big Sky Resort. This 4 bedroom, 2.5 bath unit sleeps 10 comfortably and is only steps to the community hot tub and pool (pool open in summer). It is the perfect retreat for your family and friends! The kitchen is well equipped with all appliances, dish-ware and cook-ware. Grill out on the balcony while enjoying beautiful views of the mountains! Great bonus room and washer and dryer are in the unit. Big Sky Resort, "America’s Biggest Skiing", offers winter enthusiasts 5,800 acres, a 4,350 foot vertical drop, and average annual snowfall of 400 inches. Lone Peak, at 11,166 feet, offers challenging runs, iconic chutes, and magic carpets at the base offer kid-friendly beginner runs. In the summer, enjoy Yellowstone National Park, fly fishing in the blue ribbon trout streams, white water rafting, Arnold Palmer golf course, mountain biking, zip lining, hiking, or just chill in the mountains of southwest Montana. Don't miss the free concerts, farmer's markets, and weekly special events throughout the summer! - Outstanding location – 10-minute drive to Big Sky Resort, 1.4 miles to Big Sky Town Center, 52 miles to West Yellowstone Entrance. - Full kitchen with refrigerator, microwave, dishwasher, coffee maker, stove, oven, toaster, dishware, bakeware, trash bags, dish soap, dishwasher soap, sponge, and paper towels.